This post is sponsored by Edens Garden. The thoughts and opinions expressed in this post regarding essential oils are based on my experiences and findings alone. They are not to be substituted for professional medical advice. If you have serious health problems, please consult a medical provider or licensed aromatherapist. This post may also contain affiliate links. Did you know that over 300 million people of all ages suffer from depression worldwide? According to the World Health Organization, depression is the leading cause of disability and a major contributor to overall disease, but yet fewer than 10% of affected people receive treatment. In honor of Mental Health Awareness Month, I wanted to share something that helped supplement my journey to self-care: emotional healing with Edens Garden Essential Oils. After struggling with an eating disorder and chronic depression for over 12 years, I found that using essential oils for depression played a huge role in my pursuit of mental wellness. To address the skeptics: essential oils have been scientifically proven to directly affect the limbic system, which is a part of the brain responsible for emotions, moods, pain, pleasure, and overall behavior. It also helps differentiate our emotions from happy to sad to angry and so on. When the aroma of an essential oil reaches the olfactory bulb, the bulb creates information based on the smell and sends this impulses to the limbic system. It’s not “magic” – it’s science. 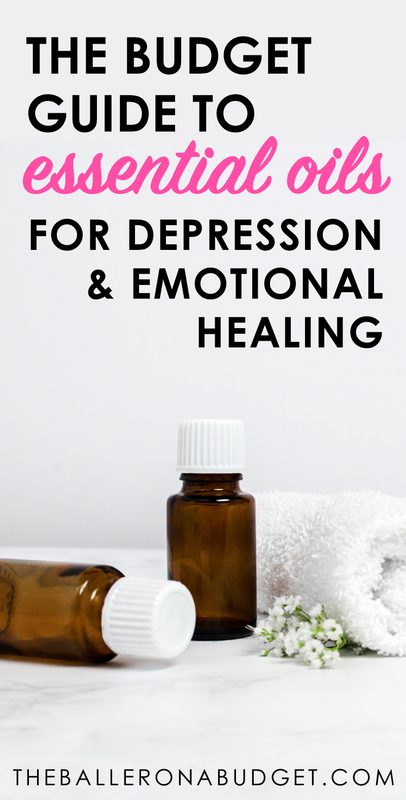 And so many studies have shown that essential oils are a powerful tool for battling mental disorders like depression and anxiety and can even treat undesirable moods such as anger, resentment, heartbreak, and more. After working with essential oils at the spa I quickly learned firsthand how oils can serve many therapeutic benefits. When I began integrating them into my own lifestyle, my journey to eating disorder recovery finally began. 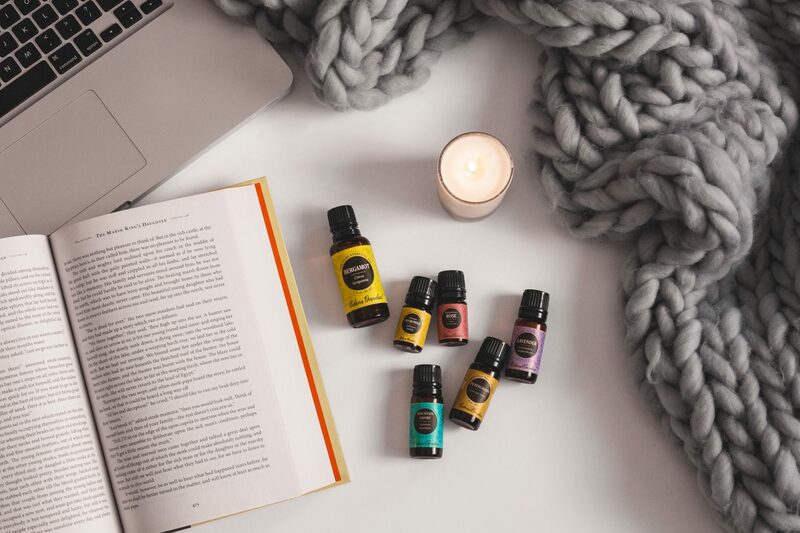 My oils became my “emotional support group”: I had oils to meditate with, oils to wake up and begin my day with, and oils to end my day with and drift off into a peaceful sleep. Continue reading to find your new favorite oil for your own mental wellness journey. What Kind of Oils Are Best for Depression and Emotional Healing? Essential oils are a huge part of my therapeutic practice as an esthetician, which means that through my job I was able to learn about both the physical and emotional benefits of essential oils. I’ve been licensed for almost 8 years now, so these are some of my tried-and-true favorites I’ve grown to love throughout my career. Although some essential oils can serve similar purposes, I highly suggest picking out an aroma you feel you might like. For example, Lavender, Roman Chamomile and Rose each have their own unique set of benefits but all have antidepressant properties; however, I would personally prefer Rose because the smell of roses is comforting to me most. Others may wind up picking Lavender or Roman Chamomile – it depends on you! Lavender is your all-purpose, budget-friendly go-to essential oil if you don’t know which oil to pick first. Physically, it relieves tension, which makes it great for things like headaches and muscle strain. It also helps regulate the nervous system, so people who suffer from poor sleep, insomnia or overall stress will benefit from Lavender. Bergamot has many more emotional benefits than other citrus oils and is commonly used as an antidepressant. It carries tart notes that help perk up even the muddiest of moods and offers clarity to minds with scattered thoughts, but also balances emotions with the calming and slightly floral afternotes. This oil is perfect for you if you need to restore your energy and optimistic perspective. Also known as Bitter Orange Leaf, Petitgrain smells just the name: a bitter citrus with an herbaceous undertone. I’ve grown to like the aroma as it helps me release anger and encourages forgiveness. I’ve found that during times of disagreements, using this before bedtime has really helped me “sleep on it” and come morning, I actually feel the desire to forgive and forget. I call this my “c’est la vie” oil. Mountain savory has a distinctly herbaceous and peppery scent that I seem to gravitate towards when I have a hard time letting go of things. It’s been known to help people let go of grudges. On the physical health side, Mountain Savory helps stimulate a fatigued adrenal gland, which is responsible for secreting hormones like cortisol. When stress triggers too much cortisol, the adrenal gland may grow fatigued. Mountain savory is also great during the winter months to strengthen immunity and works very well for candida. To me, Roman Chamomile almost has layers of aromas that can only be smelled with deep inhalations. It opens with a slightly bitter note, has an herbaceous middle scent and has undertones of sweet fruit. This oil is one of the more precious oils due to not just its antidepressant properties but because it also makes an excellent addition to moisturizers and serums for glowing skin as well as reducing inflammation and arthritis pain. Roman Chamomile also works great as a natural allergy reliever and can also alleviate PMS symptoms. Mixing it with Geranium and/or Clary Sage can make a nice massage oil to rub on the lower abdominal area for menstrual cramps. Rose is an extremely powerful natural antidepressant, shadowed only by Melissa. It requires about 242,000 rose petals to distill approximately 5 mL of rose oil, which makes this an even more precious oil than Roman Chamomile. Don’t confuse this smell for your grandma’s rosey perfume – Rose oil is a subtle floral scent that is almost fruity. I have tried many rose essential oils and Edens Garden’s Rose has to be the highest quality one I have tried. Rose is one of the most coveted oils due to its wide array of benefits: on top of being an antidepressant, it also has anti-inflammatory, anti-microbial, antiseptic, antispasmodic, astringent, and aphrodisiac properties. It’s also wonderful to reduce fine lines and hydrate the skin when used in skincare. Uplift is one of my absolute all-time favorites from Edens Garden: aside from Lavender, it’s another must-have oil. Although it’s mostly comprised of mouthwatering citrus oils that pick up low emotions, its unique twist is Melissa, a highly coveted oil due to its amazing ability to treat depression. Pure Melissa is also very expensive, which makes Uplift an affordable alternative that creates similar results. Uplift also contains Peppermint to reenergize sluggish moods and Ylang Ylang to balance hormones that may be thrown off by adrenal fatigue and excess cortisol, which triggers stress. Joy has a lot of citrus notes, but it isn’t zesty nor sharp – it’s balanced perfectly with Jasmine and Vanilla to soften the scent, making it similar to lemon cake or I daresay, Fruit Loops cereal! Oddly enough, it doesn’t smell artificial at all. It’s a very pleasant and happy aroma. Joy is a beautiful scent to diffuse into the air or wear on your pulse points and hair as a perfume if you’d like to enhance good energy and happiness. Whenever I have company coming over, I diffuse Joy and find that the positive energy is much more enhanced and everybody present gains a good mood. Worry Less is a beautiful clean scent that’s slightly sweet. It’s a blend of florals that help balance hormones and moods while Frankincense helps keep you grounded and provides clarity. This is perfect for someone who may be facing a lot of stress from several fronts and can’t seem to find their focus. If you are familiar with the therapeutic benefits of Frankincense but aren’t a fan of the earthy scent, you will love this alternative. There’s something comforting about Hope – it’s a very warm scent that almost resembles cinnamon but also has a sweet and slightly citrusy undertone that provides me with hope when I feel it is lost. If I could bottle up a hug, this would probably be the aroma it would smell like. I used this oil a lot during my hardest times of depression. Oftentimes I cried myself to sleep, and hope was the only feeling that made the tears stop. It encourages acceptance and to let go of worry and despair. Be Still reminds me of growing up in my Asian culture where my mom would always use Tiger Balm for muscle aches or a chest rub for colds. Surprisingly, Be Still is not mentholated and has no Eucalyptus in it, but its earthy formula makes it smell very medicinal but sweet. Frankincense, Sandalwood and Rose are all precious oils that give this blend extremely desirable therapeutic properties, while Patchouli and Ylang Ylang help ground the scent and tie it all together. This is a perfect scent for practicing mindfulness, being in the present moment, regaining focus and peace, or closing the day. If you often get tension headaches from high stress or extensive work marathons, Head Ease is a great oil to keep at your desk to replace Ibuprofen. Peppermint is well-known for curing headaches, but it’s so minty that applying it to the forehead can be overpowering and cause your eyes to water. Head Ease blends Peppermint with earthy oils like Frankincense, Chamomile and Helichrysum (all 3 of which are precious oils) to neutralize the overpowering minty scent while combining the anti-inflammatory properties of all the oils for an effective and natural painkiller. Now that we’ve gone through the best oils for balancing emotions, the next question is: how do you use them? There is no real right or wrong way to use essential oils, except for ingesting them in excess! This is quite dangerous and I highly recommend against it unless advised by a licensed aromatherapist. Topical application is the most practical way to use essential oils, but I always suggest using a carrier oil for this. Some oils are very concentrated and “hot” oils like Cinnamon can actually burn the skin when not diluted. A carrier oil not only helps prevent this but also reduces wasting precious drops of essential oils. 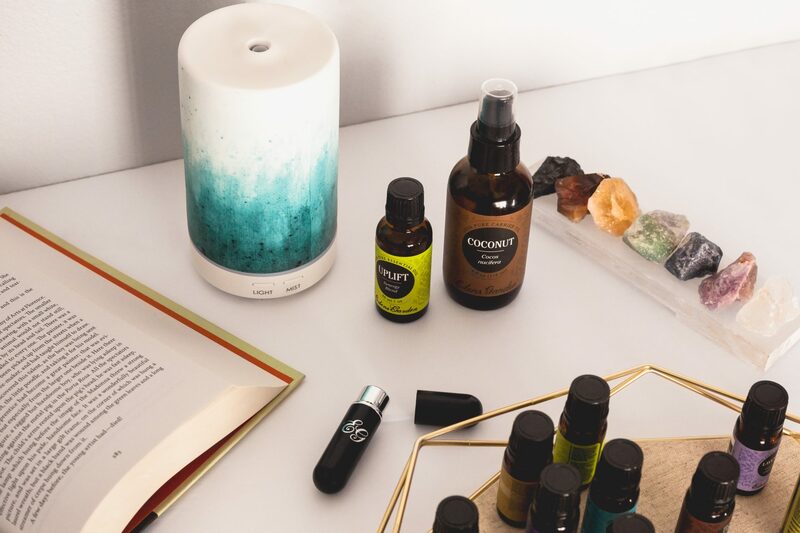 A diffuser simply diffuses the aroma into the air and helps to freshen the air or elevate the mood of any room. I’ve owned several diffusers over the past few years, but I’m obsessed with the Ceramic Ultrasonic Diffuser! Not only is it great at diffusing, but it also makes for a gorgeous piece of decor. If you’re always on the go, I highly recommend grabbing one of Edens Garden’s Personal Pocket Inhalers. I used to carry small bottles of my favorite oils in my purse, but I had several instances where I dropped them on the concrete and shattered it or even had the bottle leak in my purse. The inhaler is a more practical way to carry your favorite aromas with you while also reducing oil waste: it uses a wick that you saturate with about 10 drops of your favorite oil, and the scent doesn’t fade quickly! What Brand of Essential Oils Should You Buy? I get this question very often! Of course, I’m sure we’re informed of several popular essential oil brands out there, but I’ve tried them all and still choose Edens Garden. In fact, I’ve been using them for years even before I had the opportunity to work together with them on blog posts like this one. Edens Garden features an incredibly large library of high-quality, therapeutic grade oils at extremely affordable price points – most oils are anywhere between $3.95 – $10.95 for 5 – 10 ml. 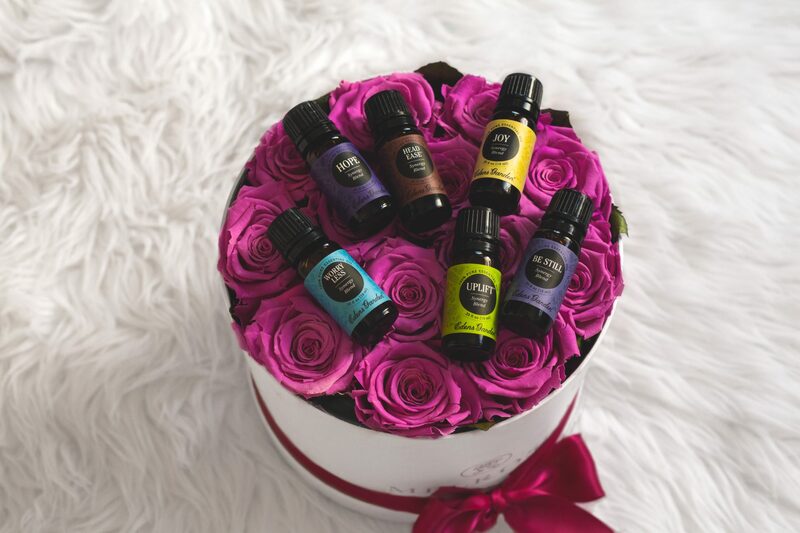 And because they are therapeutic-grade, you can rest assured that you are getting the highest quality essential oils you can get without the middle-man markup. They’ve actually been voted the #1 non-MLM essential oil company! So what do you think about essential oils for mental wellness and emotional healing? Would you use essential oils for depression or emotional healing? Let me know your thoughts in the comments and don’t forget to subscribe to my newsletter below for more budget-friendly natural remedies and health and wellness tips.